Let Dartin Studio help take your party or event to the next level, without breaking your bank. With music specially PROGRAMMED with your family in mind… it’s a fresh, fun, and clean playlist for everyone on your guest list. Dartin Studio takes great care in selecting an amazing song library. Whether you are looking for today’s chart topping pop and rock hits, hot country, today’s Christian best and yesterday’s favorites, Dartin Studio has a mix that’s right for you. let dartin studio bring out your star power with chart topping karaoke hits the whole family will enjoy. kids and adults alike love to grab the microphone and sing. Indoors or outdoors, Dartin Studio can take the sound anywhere with a completely mobile light package. Easily filling any small to medium venue, we can take to the gym, the backyard, the church or pool. want a backyard movie? dartin studio has you covered with a ten foot screen everyone at your party will enjoy. you pick the movie, we'll take care of the rest. Keeping it light and casual, or dressing to the nines, Dartin Studio is your music source for any occasion. Birthday parties, class reunions, youth lock-ins, and wedding receptions have all benefited from our fun and professional style. With a price package that is sure to fit your budget, make sure your next call for mobile music entertainment is to Dartin Studio. We were thinking of having a theme party, perhaps something from the 80's. Can you handle that? Dartin Studio simply has the best music around. We strive to have the best mix from the 50's - today's current hits. Want an 50's sock hop? A Radical 80's party? A New Jack Swing/Grunge 90's theme? We have the biggest hits to accommodate every need. My church youth group is having an event. Do you have Christian music too? We have everything you could want and more. Your favorite artists heard on Christian radio stations around the nation is at our disposal and yours. What's the best way to book Dartin Studio? Simply complete the online contact form and we'll be happy to get back with you promptly. You can also contact us either by phone (580-262-0886) or by email (dartinstudio@yahoo.com) to discuss your needs and we'll provide you with our services and prices. Setup times can vary between each event but typically we aim to arrive an hour and a half before the start of your party. Tear down typically takes just less than an hour. You are never charged for that set up or tear down time, only for your event time. We do require a deposit to secure your date. Dartin Studio will send you an online invoice which can be paid using PayPal. If cash or check are the only options, arrangements can be made. The remaining final payments are also paid to Dartin Studio no less that one week prior to your event. We'll have guests of all ages. Do you play clean versions of songs? Absolutely. Dartin Studio has access to top industry music resources, which service radio stations across the nation. You don't have to worry about what the DJ or the song will say next. It's good clean fun with Dartin Studio. We need music for our wedding as well as our reception. Your wedding day is very important, not only to you, but also to Dartin Studio. You want everything to be perfect. So do we. 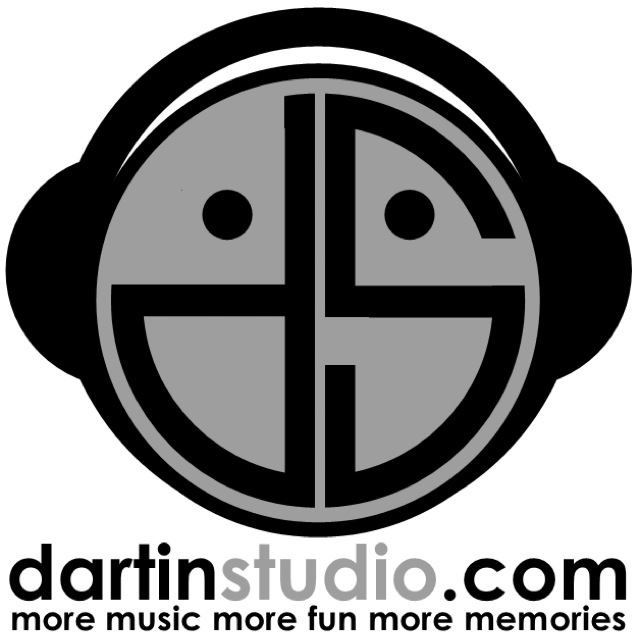 Depending on the location and your needs, Dartin Studio can provide music for both events. We may need to be at your wedding rehearsal to have everything in step. If so, a small fee will be added to your total to cover our costs of transportation. This will also include the quick break down and reset in a separate location to accommodate your wedding/reception needs. Dartin Studio has a great projector and 10' screen that's perfect for throwing the best poolside movie party on the block. You provide the popcorn. Everyone loves karaoke. Get a mic in someone's hand and they become a rock star for 5 minutes. There's no extra fee for Karaoke. It's included with your service package, but we do need to know before hand if you want karaoke. It does require a little different set up, but again, it doesn't cost you any extra. How do I know Dartin Studio is a good company to hire? Part of keeping our costs low, requires that we don't spend a lot on advertising. Dartin Studio has always valued word-of-mouth over any form of advertising we could pay for. We pride ourselves on having satisfied clients who happily spread the word about our services. One happy client, brings more happy clients. That's what you'll come to expect with Dartin Studio.